Tay Ninh is located to the southwest of Vietnam. It shares a border with Cambodia in the west and north. 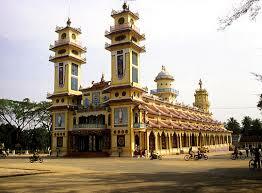 It is surrounded by Ho Chi Minh City, Long An, Binh Phuoc, and Binh Duong. The main ethnic groups are Kinh, Cham, and Khmer. The annual average temperature varies between 26 and 27°C. Economic potentialities: production and processing of tropical agricultural products (sugar cane, rubber, shrimp, etc. ), tourism. Famous sites include Ba Den Mountain and Kim Quang Cave Museum. The province is the habitat of several valuable species of animals and insects. Tay Ninh is 64km from Cu Chi, 96km to the north-west of Ho Chi Minh City. Get there by motorbike, car, or public bus. Regular buses leave Tay Ninh hourly for Ho Chi Minh City (Saigon Mien Tay Station), via Cu Chi and with frequent stops. The trip takes about three hours. Tay Ninh Bus Station is in the north-west of the city.